St. Martin's Griffin, 9781250093868, 256pp. Ella's life has been completely upended. She's young, beautiful, and deeply in love--until her husband dies in a tragic sailing accident. Or so she'll have everyone believe. Screenwriter Hunter needs a hit, but crippling writers' block and a serious lack of motivation are getting him nowhere. He's on the lookout for a love story. It doesn't matter who it belongs to. When Hunter and Ella meet in Watersend, South Carolina, it feels like the perfect match, something close to fate. In Ella, Hunter finds the perfect love story, full of longing and sacrifice. It's the stuff of epic films. In Hunter, Ella finds possibility. It's an opportunity to live out a fantasy--the life she wishes she had. And more real. Besides--what's a little white lie between strangers? But one lie leads to another, and soon Hunter and Ella find themselves caught in a web of deceit. As they try to untangle their lies and reclaim their lives, they feel something stronger is keeping them together. 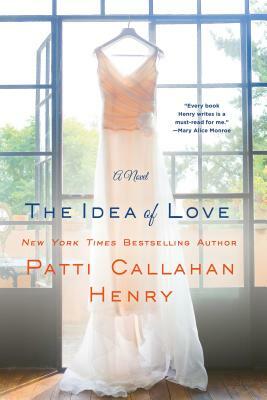 From New York Times bestselling author, Patti Callahan Henry, The Idea of Love asks, "Can two people come together for all the wrong reasons and still make it right?"